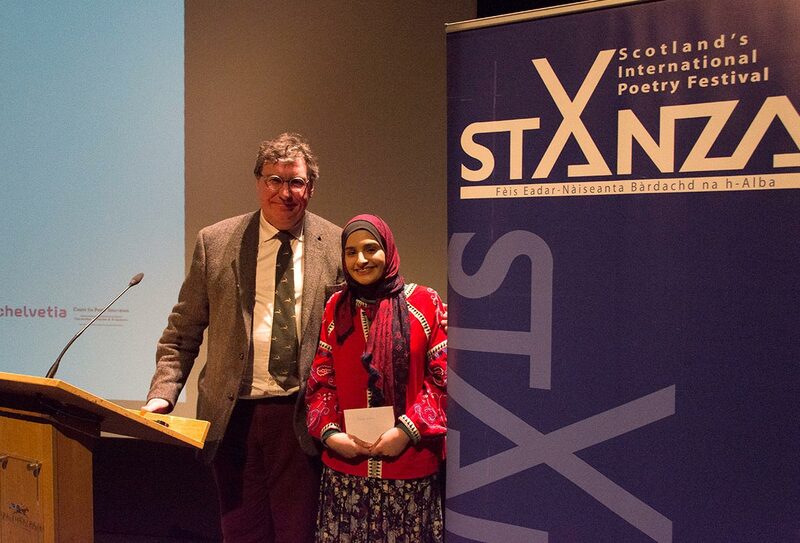 Prof John Zajicek, Course Director for BSc Medical Science at the University of St Andrews, with prize winner Rumaisa Zubairia from Glasgow University School of Medicine at Stanza 2019. Winner and runner-up prizes in the Poems for Doctors Online Poetry Slam were announced last night at the Stanza International Poetry Festival launch event, at the Byre Theatre in St Andrews. After judges and poll results were combined the runner-up was Rania Fernandes a student the University of Dundee Medical School for her poem ‘Inspiration’, and the winner was Rumaisa Zubairi who is studying at the University of Glasgow School of Medicine. Rumaisa performed her winning poem ‘Fexor digitorum’ at last night’s event. Congratulations to our winners of course, but also to all of those who took part in the competition. Our judges were highly impressed by the standard of entries, and we hope that all the competitors will continue to explore and develop their interests in poetry.